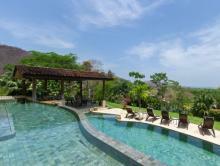 Great Costa Rica Deal: Rainforest and Beach! Visit the famous Arenal Volcano, where you will stay at charming mountain cabin at Lomas del Volcan Hotel. Possibilities are endless here! Explore Costa Rica’s rainforest, do a canopy tour with zip lining or a gondola ride (or both! ), visit famous hot springs, go white water rafting, or try waterfall rappelling. Once the adventures are over and you’re ready to unwind, you’ll be transferred to luxury boutique hotel Villa Buena Onda, set in the hills above Playas del Coco. Relax and sunbathe by the two-tier pool, enjoy the great ocean views while lounging with a cocktail, explore the varied menu with your included meal plan, and indulge yourself with a spa treatment. Now guests will even have access to the exclusive facilities at The Club at Coco Bay and the Beach Club at Playa Ocotal. Make use of the gym, pool, and tennis courts and have access to snorkeling gear, yoga lessons, and the spa. Pick and choose or do it all—the choice is yours. You deserve it! 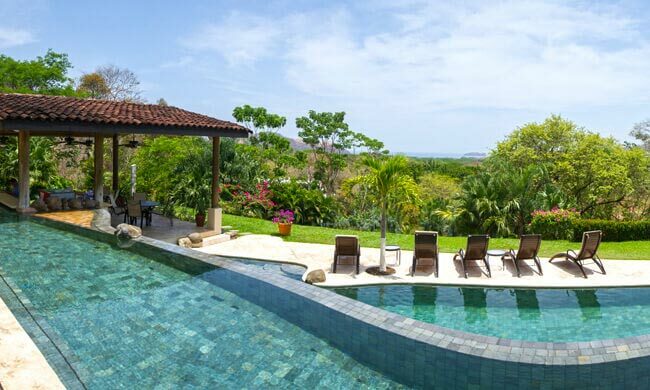 4 nights lodging at Villa Buena Onda—including 1 night FREE! Fly into San José, where one of our representatives will meet you at the airport and show you to a private transfer. After a three-hour drive through the beautiful Costa Rican countryside, arrive at your very own mountain cabin in Lomas del Volcan Hotel, set on the slopes of Arenal Volcano. Start off your vacation right with a Hanging Bridges and hot springs tour. 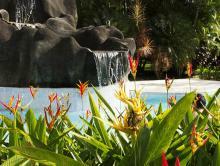 See the beautiful scenery of Arenal and then relax in the soothing thermal water of the hot springs. Enjoy exploring on-site nature trails, or a dip in the pool with a magnificent view of the Arenal Volcano. Why not take a tour of the volcano or go zip lining? You can also visit La Fortuna town and check out the little shops and restaurants in the area. Have an adventure on the way to your next location. 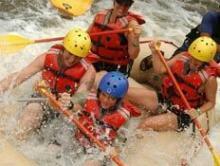 Enjoy some action during one of the most popular activities in the area: white water rafting! Paddle hard while you feel the refreshing spray of the water as you navigate the rapids. Back in the transport, you’ll be on your way to the boutique luxury hotel Villa Buena Onda. This secluded, adult-only hotel with great ocean views is set in a charming coastal town of Playas del Coco. Enjoy your a la carte meal plan and relax by the pool while sipping a cocktail and taking in the sun. Conveniently located near some great sites and nature spots, the hotel gives you access to tours such as sport fishing, birdwatching, snorkeling, scuba diving, and more. Don’t forget about your $120 bar credit! Make the most of your last day and repeat an amazing activity or try something new. For example, opt to finish off the trip with a relaxing, Swedish couple’s massage. After a short 20-minute private drive, you’ll be at the Liberia International Airport where you will catch a flight back home. We hope you come back soon! Get up close and personal with the native flora and fauna of the rainforest, then relax in hot springs! This is the best way to travel from the Guanacaste beaches to San Jose / Arenal or Monteverde (or vice versa), and enjoy an adrenaline-filled white water rafting trip along the Rio Tenorio.